According to the charity, Mind, one in four people in the UK will suffer a mental health issue every year, with one in six of us experiencing a common mental health problem such as anxiety and depression. When breaking down these numbers, out of a relatively small team of 20, five of your staff could be experiencing mental health issues at any one time – and this could be costly for your company. It is estimated that in 2016, absence rates rose to 6.9 days per year per employee, with an associated average cost of (approx.) £554 per head. Then there is incalculable cost of presenteeism – employees turning up for work when they are unwell and not being productive. With problems such as depression, anxiety, phobias and OCD on the rise, it’s remains a mystery why mental health is not at the top of every HR agenda. Earlier this month the BBC reported on an email sent by a web developer, Madalyn Parker, to her team at Olark.com, together with the response she received from her CEO. 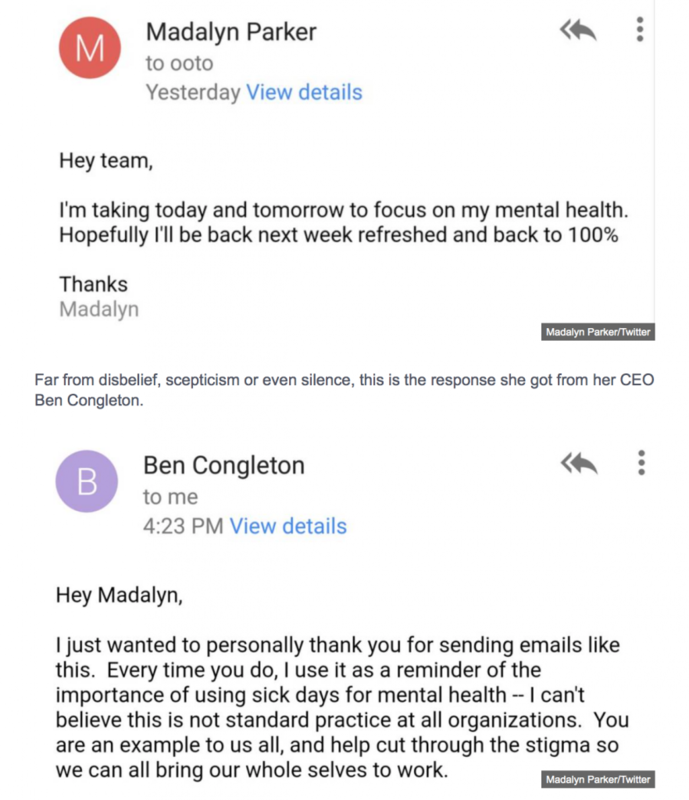 Madalyn and Ben’s email exchange has since been shared on social media more than 13,000 times and has been heralded as a massive step forward in battling the stigma of mental health in the workplace. Whilst it is often not practical or even permitted for employees to take time off from work to focus on their mental health, as the BBC reminds us, SSP covers both physical and mental health, and employees don’t need to produce a doctor’s note unless they have been sick for more than seven days in a row. With the latest Panorama investigation uncovering that ‘unexpected’ deaths related to mental health have risen by more than 50% in the last three years, as an employer, affording time off to your people to regain a focus on their mental health seems like a practical – and profitable – thing to do. A mental health friendly workplace starts with your responsibility and ethics as an employer. Much like giving your staff time off for community work that boosts your corporate profile, earning a reputation as a mental-health friendly employer can do wonders for your company image. Whether you want to provide support through an Employee Assistance Programme, allocated time off to refocus, yoga classes or privately-funded stress counselling, whatever you do, make sure you communicate your ethos to your staff. The stigma that surrounds issues of mental health can often prevent people from seeking help, so make sure your staff know where to turn if they are experiencing a problem. It may not always be practical, but where certain jobs allow try to accommodate the needs of your team. If you know someone is struggling with childcare during early starts, don’t make them feel like they have to choose between their job and their children – you will lose every time. Take the pressure off by allowing them to start and finish work later. If it is not detrimental to the running of your business, there are many ways to be flexible with hours, working pace or modified responsibilities. Every day is a busy day, and in some workplaces if the routine is interrupted then it can have disastrous consequences. However, there are times when you simply need to slow down and refocus your team. Allowing your staff to work for 50+ hours for weeks on end is not good practice. Incentivise them for a great effort with small but meaningful rewards – a half day finish once a month, an extra holiday day on their birthday, a late start on a Monday morning. Incentives don’t need to be financially driven, sometimes people really do respond to just a little extra time to themselves. If you need support with implementing mental health policies or campaigns in your workplace, talk in confidence to one of our expert HR consultants at Human Results.